The cat's eyes is a low cost safety gadget that can be installed at various locations and in various ways to warn the road users. Based on the simple principle of the law of reflection these simple road safety gadgets are known worldwide. The cat's eye falls in the category of raised pavement markers and is a retro reflective safety device used in road marking. It originated back in the 19th century and is used all over the world today. Through a small facet, the cat's eye road signs work wonders in guiding the drivers way ahead especially at night. The Cat's eye Studs should be bright enough to illuminate the road at night and should be tough enough to withstand all weathers and vehicles driving over the top of it. Raised pavement marker's installation rules out the impractical availability of traffic lights, thus, helping in the conservation of energy as well. Cat's eyes Safety markings are used to control traffic and encourage safe driving conditions. They are also known as traffic delineators, raised pavement markers, road markers, road reflectors, cat eyes or road studs. Though most of them have a reflective lens that reflects the light from vehicle headlights, some do not have reflective lenses on them and thus serve only to regulate the speed. Raised pavement markers are used for a variety of purposes, and are especially important for making traffic lanes visible to drivers at night, making dangerous curves visible and guiding the drivers of the alignment of the road. Cat\'s eyes are used to control traffic and encourage safe driving conditions. Cat's Eyes Road lights can be installed in specific patterns to create various traffic control solutions. 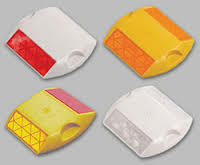 When ceramic road reflectors are placed close together in rows, spanning the width of a road, they can form a traffic calming rumble strip which helps in reducing speed. Pedestrian crossing zones are also sometimes created with reflectors to facilitate the pedestrians and the drivers both. The purpose of installing cat's eye in the area is to separate out vehicular lanes, avoid frequent changing of lanes and more importantly, prevent swerving which is the most common cause of accidents. The presence of the cat's eye would ensure that the vehicles stay within their designated lanes, and would therefore limit their speed to 40 kilometers per hour, which is the maximum limit according to international rules.The Cats Eyes are originally white in color and are installed above the pavement marking that separates lanes or separates the middle of the road. However they are available in other colors and each color specifies a different function. Red studs are used to warn drivers that they are nearing the edge of the road. Amber studs are installed along a dual carriageway. Green colored studs signify the edge of the main carriageway. Green/Yellow studs warn drivers that there are temporary adjustments to lane layouts e.g., near under construction zones. In Pakistan however, only white, yellow or red cat eyes are observed bearing a four sided or circular figure. They are usually made from ceramic, plastic or metal. In efforts to make the roads safer and at the same time address traffic problems, metal road studs individually called "cat's eye" are installed on the lane dividers along many corridors and major arterials in Karachi City. The installation of the cat's eye is in response to the increasing number of vehicular accidents in the city. But sadly most of the cat's eyes are either stolen; drug addicts are mostly involved in the theft of these road safety gadgets or have weathered prior to their expected life cycle due to poor quality or lack of maintenance. For areas where traffic movement is high or for a more permanent placement of the cat's eyes, epoxy or bituminous adhesive should be applied which is a better way to adhere the reflector to the asphalt. These insignificant pieces of metal contribute a lot in the field of transportation; even if the reflectors lower the risk of accidents by 1/100th of 1 percent they fulfill a necessary role in saving human lives.